The Magnificent Brigadune Direct Oceanfront Condominium Complex is situated on a peninsula and overlooks the Atlantic Ocean providing for spectacular breathtaking ocean views. The Brigadune is located on the quiet and prestigious Shore Drive, between Myrtle and North Myrtle. Just South of the Kingston Plantation, North of Marriott’s Grand Dunes and directly behind the famous Dunes Country Club. 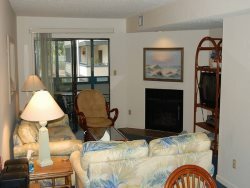 This fantastic high rise complex offers the ultimate in oceanfront vacationing with numerous amenities including an outdoor oceanfront pool (heated in Spring and Fall), picnic area, gas barbeque grills, elevators, secure lobby, 24 hour on-site security, beautifully landscaped grounds and covered on-site parking. This three bedroom unit on the 17th floor has fantastic views of the beach and ocean with tile and laminate flooring throughout. Modernly furnished with internet and TV's.